Following the recent National Gallery restoration that launched a £1.5 billion Leonardo blockbuster, comes news of a brace of corporately funded restorations (- two pictures and a classical sculpture) at the Prado. The energy corporation Iberdrola is acting through its cultural off-shoot, “Fundación Iberdrola”, to “Raise awareness about the contribution of the IBERDROLA Group to society” by allocations of pre-tax profits dedicated “decisively to the promotion and dissemination of art and culture in the territories where IBERDROLA operates”. As part of its green image-building campaign of Good Works (which includes illuminating buildings at night and training young researchers in the energy field) the foundation has made itself “Protector Member” of the Prado’s “Restoration Programme” which encourages restoration research and trains restorers within the museum to the tune of 300,000 euros per annum. Our prime fear with Art/Business relationships in the treatment of unique, historic and irreplaceable works of art has always been that the commercial tail might wag the custodial dog; might press for excitement and drama over minimalist judicious and restrained intervention; for more frequent rather than less frequent interventions – in effect, might expect big bangs for big bucks. A second concern is that corporate restorations receive over-hyped and propagandistic “Good News” promotion as instruments of miraculous “recoveries” and “discoveries”. This last practice compounds the problem of chronic unaccountability in art restoration. Restorers who work in-house at museums are, for obvious reasons, given full political protection for their actions however controversial or demonstrably harmful they might be. Museums rarely concede that even long-past restorations were harmful and almost never admit to recent – let alone current – injuries. 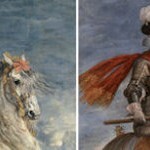 When reporting the Prado’s latest restorations, the online Artdaily.org, echoes Iberdrola’s own website account of the treatment of the monumental, paired paintings “Philip III on Horseback” and “Margaret of Austria on Horseback”. As the proselytising global energy giant puts it: “These paintings have been rehabilitated by the art gallery’s team of technicians with the backing of Fundación IBERDROLA as a supporting member of its restoration activity. The labour of specialists has allowed for recovering the original values of both portraits, which were significantly affected by the accumulation of dirt and the alteration of the varnish that had buffered the contrasts of colour”. Both accounts fail to appraise the Prado’s own before and after cleaning photographs which show changes that seem arbitrary and artistically injurious (see Figs. 1, 4 & 5). Such preparedness to accept on trust that the latest photographically recorded states are the best, most “advanced”, most reliably truthful – and even “original” – conditions of historic works of art reflects a wider and dangerous absence of properly critical appraisals of restorations. It would seem axiomatic that if works of art are to be altered (and then re-altered by the next generation) the processes concerned should be absolutely transparent and freely discussed. Artdaily trills that the paintings have been “fully restored to their original appearance” by the removal of a “veil” of dirt and “altered” varnish; and, that the restorers “allowed for the recuperation of [the pictures’] original values”. This is naive and illogical: if removing the “veil” had revealed the original paintwork, what would need to be recuperated? More recently, in his posthumously republished Catalogue Raisonné (Taschen/Wildenstein, 1996), José Lopez-Rey describes a bewildering array of attributions and summarises that most scholars are agreed “on the strength of visual evidence that this equestrian portrait […had been] executed by a lesser hand and later reworked by Velázquez or under his direction”. 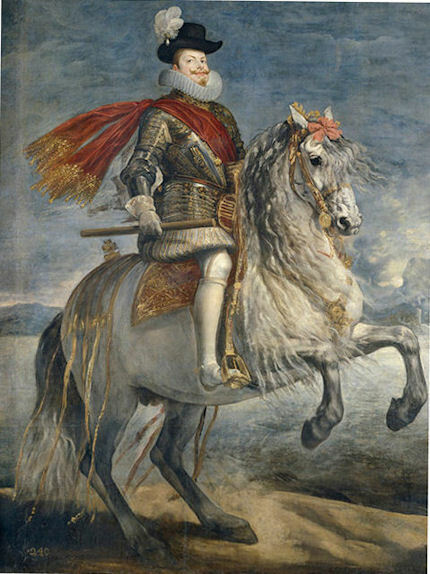 Lopez-Rey adds that “Whoever the original painter of Philip III on Horseback, the painting has been visibly repainted, mainly the head, chest, forelegs and tail of the horse, possibly by Velázquez or an assistant in about 1634-35” and that by 1772 both Philip III and Queen Margaret had been extended from vertical to roughly square formats by additional vertical strips of canvas on both sides. 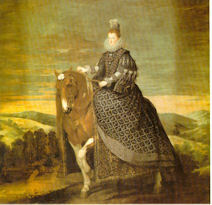 Re Iberdrola’s hyperbole, Lopez-Rey draws distinctions between the entirely autograph Velazquezs “The Surrender of Breda” and the equestrian portraits of Philip IV and Prince Balthasar Carlos; the equestrian portrait of Queen Isabel, where Velazquez’s hand is “recognisable”, and the two recently restored works under consideration here, where that authorial hand is present only to a “lesser degree” in pictures “which were mostly executed by other painters”. 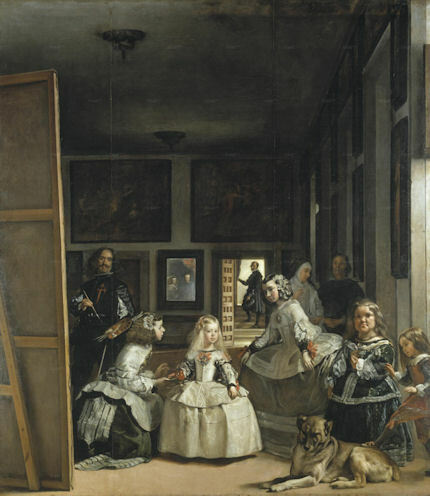 Given this consensus of uncertain authorial contributions, Iberdrola’s attempt to spin authentic Velazquez silk seems brazen when the Prado’s own before and after restoration photographs of the Philip III show so many artistically disturbing changes. During their latest restoration/recuperation, the sections of canvas that had been added to the sides of both paintings during the 18th century were cut off. Artdaily says that these additions had been made to make the paintings compositionally compatible with other works when installed in a new room in the Royal Palace in Madrid. 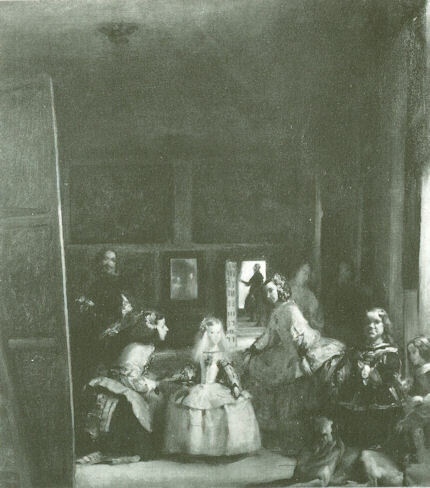 The Fundación Iberdrola justifies stripping these historical extensions on the grounds that their removal has created a greater compositional contrast between the two pictures and the three great autograph Velazquez equestrian portraits of Philp IV, Isabel of Bourbon and Prince Baltasar Carlos. Artdaily describes the cleaning and the cropping together as having achieved the greatest possible recuperation of the “original perceptual conditions“. What is not acknowledged by either party is that this removal of historically resonant material has served to eliminate possibly discomfiting visual testimony to the original condition of the paintings (- at least insofar as it had survived into the 18th century) and made the task of gauging the effects of successive restorations almost impossible. It can be assumed that when those strips were added, their values matched and seamlessly extended the then extant values of the two pictures (as with the repair to Michelangelo’s Sistine Chapel frescoes discussed in our April 1st 2011 post). What, therefore, might account for the mismatched values that had emerged and persisted (see right) until the recent twin restoration? 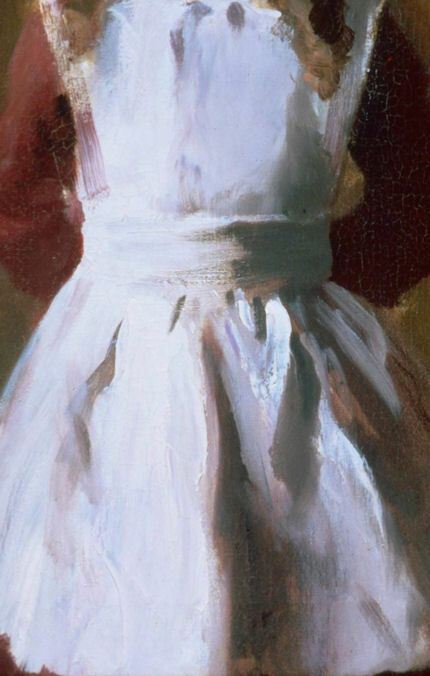 The strips would likely have been painted by a single artist, in a single campaign and without need for making the numerous revisions and re-revisions by the assorted, variously attributed hands that are evident in the paintings themselves. It is unlikley that any paint layers in the extensions would have been made over already varnished paintwork and therefore be at risk of floating off during cleaning. Conspicuously, the most obviously exculpatory explanation for the mismatch of tones – that the additions had matched the values of the picture when under an old darkened varnish – has not been offered. 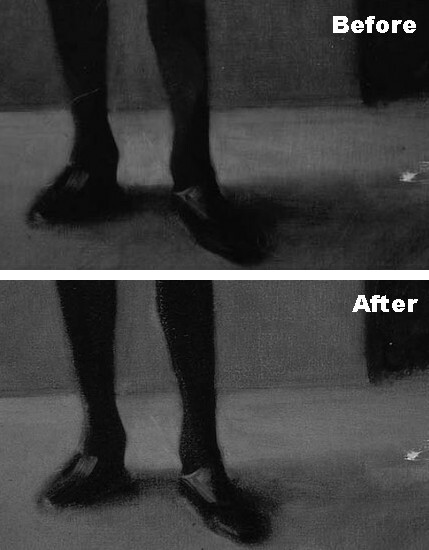 The restorers reportedly attribute the mismatches solely to the technical fact that the bordering strips had been painted over darker ground colours than those in the paintings, and that this had somehow caused “the pigments in the two areas [to have] behaved differently over the course of the centuries”. This does not hold water: while darker grounds would certainly come to influence the values of the extensions as the overlying paint became translucent with age (as can most clearly be seen in the “see-through” of the first state of Philip III’s horse), it could not alone have done so to such striking (and varying) extents as have occurred in the two paintings. 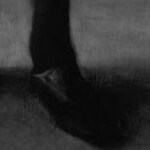 Whereas, the fact that darker grounds were used on the extensions would itself suggest an initial perceived need to match the then darker values of the paintings. There is another reason for disregarding the current restorers’ explanation. If the dark ground theory were correct, the mismatch phenomenon would have arisen very slowly over time and not have – as the photographic record shows – lurched into being on successive restorations (see Figs. 2, 6 & 7). 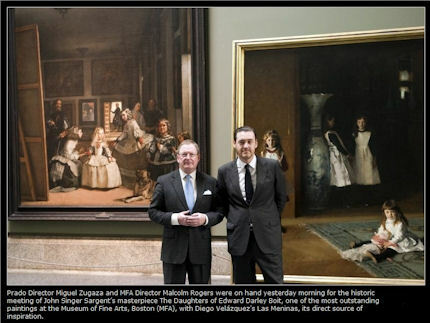 Artdaily has not shown before and after photographs of the Queen Margaret, which painting Lopez-Rey describes in the 1996 edition of his catalogue raisonné as having been restored in 1968. His post-1968 illustration is shown here in Fig. 2. However, in the 1978 edition of the book an apparently earlier (and presumably pre-1968 restoration) state is reproduced (see Figs. 6 & 7 for details of that state). 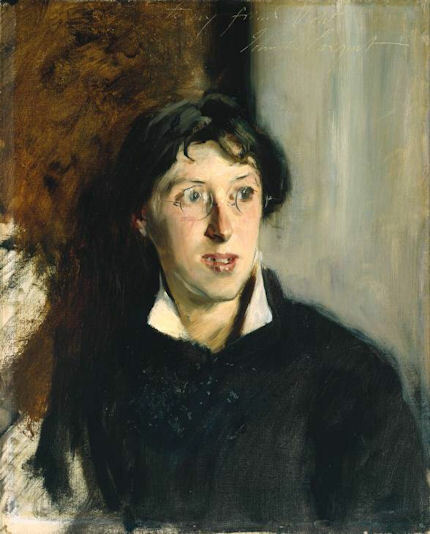 At that date, the left-hand extension read only fractionally darker than the painting, and although the right-hand extension was appreciably darker it was less obtrusively so than was the case after the 1968 restoration. As described opposite, and as can clearly be seen in Fig. 7, the impact of the dark ground was neglible at the brightest part of the sky, on the horizon, where it might have been expected to be most evident. The original dramatically escalating darkness in the sky above those points should, therefore, properly be taken as part of the original tonal schema – and not as either accumulated filth or ground paint see-through. The similarity of the states in both paintings, as seen in Fig. 2, might suggest that the Philip too had been restored around the late 1960s. The differences between the pre and the post 1968 restoration states of the Margaret speak of massive changes of value being made during a single “treatment”. The horse, for example, was reduced from a deep rich chestnut to a tan colouring. That the earlier chestnut appearance had not been a by-product of some filthy misleading “veil” is demonstrable: the whites on the horse’s muzzle and upper left leg read as white not yellow or grey or brown. Whatever might account for the radical changes, it was not consistent with the removal of some overall disfiguring layer. Above, Fig. 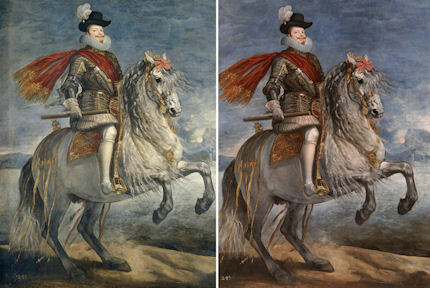 1: “Philip III on Horseback”, before (left) and after (right) its recent restoration as shown in artdaily.org, with photographs by courtesy of the Prado. Consider this: if restorations did no more than simply remove dirt and discoloured varnish, then with each restoration a work would be returned to its condition when last cleaned. This does not happen – every restoration produces a new, different work – but were it to occur, there could be no news-grabbing claims about miraculously recovered original conditions. Were it to occur it would also be possible, by placing photographs of today’s restored works against photographs of the works when last restored, to reassure art lovers that nothing untoward happened during restoration. 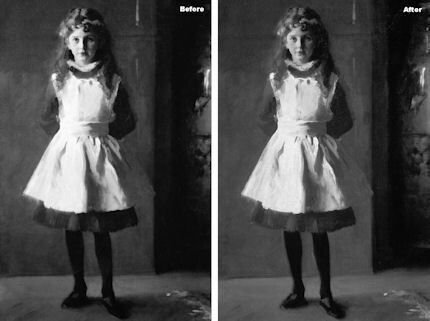 Such photographic comparisons are not volunteered because they cannot be; because, as frank curators admit, in every restoration there are losses as well as gains; there is always a trade-off between improved legibility and losses or corruptions of artistic content. Above, Fig. 2: “Philip III on Horseback” (left) and “Margaret of Austria” (right) as shown in the 1996 Taschen/Wildenstein edition of José Lopez-Rey’s “Velazquez ~ Painter of Painters”. With regard to the reliability of these photographs, unless otherwise established, we take them to have been judged by the authors and publishers to have derived from reliable sources and to constitute fair depictions. Concerning the testimony of photographs generally, they do not need to be absolutely accurate and truthful (although that is, of course, a desirable goal – see Gareth Hawker). In two respects their testimonial value is essentially relative. That is, it is the patterns of values within a photograph that are crucial – the linked ratios of tone/hue values. (If a tone which goes into a restoration darker than its neighbours emerges lighter then there is, ipso facto, cause for investigation and explanation.) Similarly, much of the testimony of individual photographs lies in their appearance vis-a-vis earlier and later photographs. Both of the two photographs above are markedly different – and in the same way – from their earlier counterparts in the 1978 Italian edition of Lopez-Rey’s book. Both of the paintings then were much darker (and handsomer – see Figs. 6 & 7), and in both cases the discrepancies between the original paintings and their 18th century extensions were then less pronounced and artistically disruptive. In the photographs above we can see that although the extensions are now markedly darker than the centre sections, they are not uniformly so. 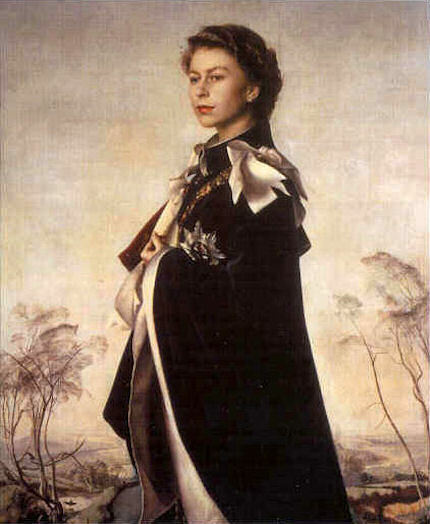 The darkest passages occur in all of the corners of the Philip and in three of the corners in the Queen Margaret picture. At that date artists worked hierarchically, with figures – especially monarchs – pre-eminent, and backgrounds (landscapes, seascapes, skies) subservient. The lighter tones of heads and their fineries were commonly thrown into relief and pictorial promininence by conveniently dark clouds or foliage (see Fig. 6). 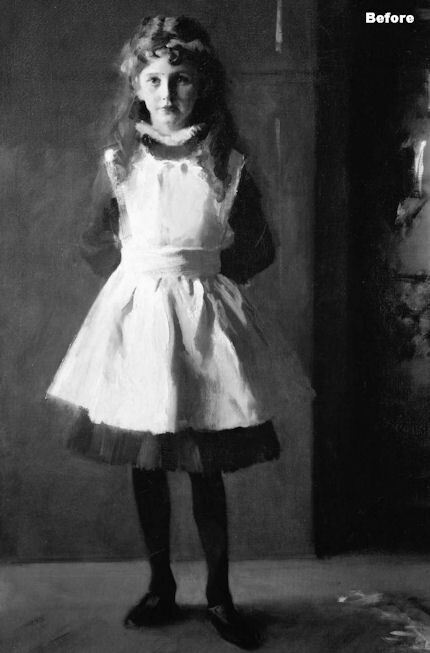 Artists did not transcribe their values from camera obscuros, they manipulated them to suit their own purposes. Had the darkness of the extensions been a consequence of underpaint show-through, its disfiguring presence would have been most apparent where the lightest values fall, which is in the bottom of the sky at the horizon. In fact, any see-through distortion is least apparent at those points (see below). It seems safe to conclude, therefore, that paint, previously present elsewhere, has been lost. By an accident of chemistry, it is the darker pigments, such as burnt umber, that are most vulnerable to cleaning solvents. Above, Fig. 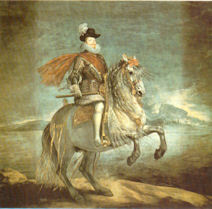 3: “Philip III on Horseback”, attributed to Velazquez and others, as shown in the 1996 Lopez-Rey. To appreciate the scale of changes that restorers’ make, the photograph above, which predates 1996, has been cropped to the format shown in the before and after photographs shown above and below (Figs. 1, 4 & 5) which record the effects of the painting’s recent treatment and surgery. The shifts of value are enormous. The surgery was radical – the 18th century additions were removed. The claims made by the restorers’ are matchingly enormous. These paintings are said to be “fully restored to their original appearance”. It is claimed that “While it was previously difficult to appreciate the merit of these works within the group (other than for their purely iconographic merits) , these are now absolutely evident.” It is specifically claimed that a new dynamism has emerged in the Philip III and that this has been transmitted “through the foreshortening of the horse and the luminous sky behind the figure“. The foreshortening of the horse was a done deal before this restoration began. As can be seen in Fig. 5, however, the painting has acquired an overall, florid colouring. The sky may be a cooler more uniform blue but it has lost its previous theatre and differentiations. The lights in the painting came from two sources. There was a brilliant, off stage-right “spotlight” that lit the front of the horse and the monarch, whose own brilliantly illuminated and modelled leg bisected the horse’s primary lights and shades. Additionally, there was a raking general light from the horizon that reflected in the water, throwing the horse’s darker tones into relief. These effects, as they survived in Figs. 3 & 4, have not been enhanced by restoration or recuperation, they have been weakened. By liberating blueness at the expense of tonality, the sky, instead of receding and throwing the horse and rider into relief, now simply obtrudes. Above, Fig. 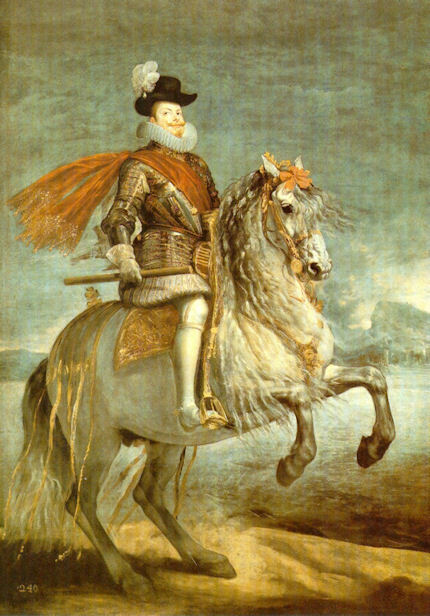 4: “Philip III on Horseback”, before the recent restoration, as shown in artdaily.org. One the hardest things to establish in restorations is the extent to which restorers wield their own brushes. To spot their tiniest but often crucial interventions (on the most sensitive and expressive parts of faces, for example) requires the provision of detailed photographs recording after-cleaning and after-cleaning-and-retouching states. The two artdaily photographs are sufficient, however, to show that massive retouching (“recuperation”?) occurred in one zone. Before this last intervention, the originally positioned baton carrying arm of Philip showed through the painting of the sky. Now (as seen below) it does not. What other additions were made? 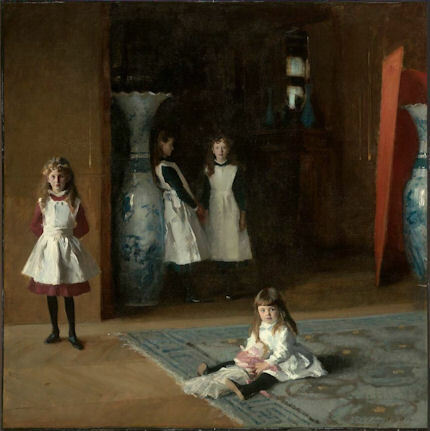 What proportion of this now “fully restored to… original appearance” painting is a product of the 21st century? Above, Fig. 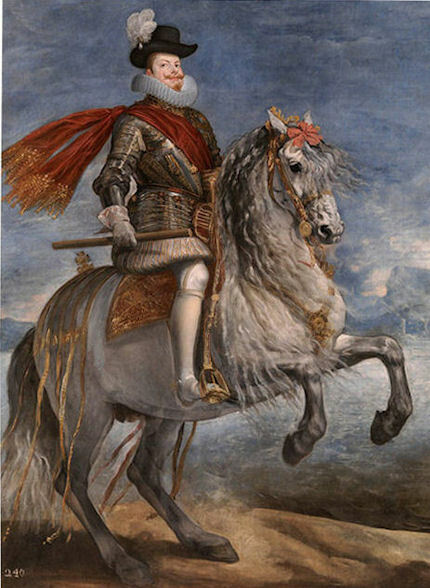 5: “Philip III on Horseback”, after the recent restoration, as shown in artdaily.org. One noteworthy injury in this painting can be seen at the horse’s left knee. Previously, as seen in Figs. 3 & 4, the contour of the leg was articulated by the contrast between the light upper surface of the leg and the adjacent dark of the distant town across the water. With the eradication of that strategically placed, pictorially functional dark zone, an ungainly thick dark bar has emerged that attaches to neither the horse nor the town but instead floats on the picture surface. In all probability its original function at an early stage of painting had been to serve as a shorthand guide to the artist of the tonal requirement that would later be needed to throw the advancing horse into relief. Above, Fig. 6: Artdaily does not show photographs of the restored Margaret but an earlier restoration seems apparent in a comparison of the plates in the 1978 and the 1996 editions of José Lopez-Rey’s book. 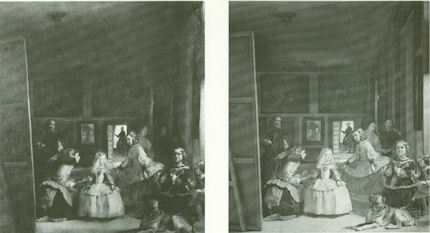 We see in the details above left and below left the painting before its 1968 restoration. The differences between them and their later counterparts are remarkable. No educated eye could equate the differences between these states with a straightforward removal of an overall film of dirt, or discoloured, “veiling” varnishes. The changes are variously too abrupt, too arbitrary and too injurious to the force and strength of the picture. No overall covering could return the washed-out post-1968 restoration state to its former vigour. No discoloured varnish could now “recuperate” the former chestnut of the horse from the succeeding tan colouring, on the one hand, and/or simultaneously restore the wooded valleys of the bottom right to their former vigour and panache. A single, seemingly intractable passage of paint gives the lie to successive treatments of this picture. We see in the tiny recalcitrant dark remnants of trees that still cling to the edge of the side of the second hill down from the horizon, the last corroboration of the values in the original picture that had been matched on the extension canvas. We see them here, as in the aftermath of the 1968 restoration, but will not, presumably, see them again, given the recent “recuperating” removal of this mute information-rich canvas extension. Above, Fig. 7: the right-hand extension of the “Margaret of Austria on Horseback”, before (left) and after (right) the 1968 restoration.